This one is as individual as the person using the spa. In general it is great to have enough room to move about, stretch and relax. For taller persons, this may mean a longer hot tub. Hot tub size has three dimensions: length, width and depth. This may seem obvious, but let’s take a closer look at each one. Many hot tubs are square and all hot tubs usually provide outer measurements. This is the longest side of the hot tub. It is usually the side with a lounger if there is one, for reclining. The lounger seat is sometimes formed so a tall person can fit with slightly elevated knees. Note that if a filter canister or other obstruction is built into the lounger side, then the reclining length will be shortened. What is not so evident about the length is that it is an external measurement. If the particular hot tub manufacturer uses an extremely thick edge, then the actual interior length will be that much less. 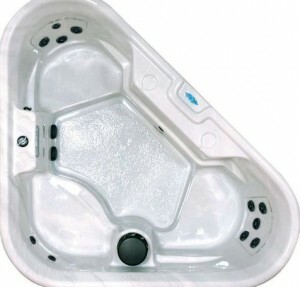 Spa manufacturers such as QCA Spas use a thinner edge, so there is more interior room and dimension. This is a little harder to work with in production, because all the plumbing needs to fit in a smaller space, but the result is a roomier hot tub with fewer barriers. Sometimes this is the same as length and so the interior width needs to be viewed to be sure there is adequate space, just like the length. This third dimension is the one that is not so obvious and gets passed over when first looking at hot tub dimensions. However, the depth quoted is again usually the external depth. It may look impressively deep in a showroom, like 32″ or even 36″, but if a false bottom or “pedestal bottom” is used, then the interior depth can be quite a bit less. This translates into more cramped seating and less room for legs. A true depth bottom such as those found on QCA Spas, means again more seating room. Another way to verify how much room there is when comparing spas is to look at the volume figure for water. If the volume is higher, there is more interior dimension available for seating. That coupled with barrier-free seating gives you the most amount of room for a given dimension spa. So not all length X width X depth spas are the same, and it pays to be sure the spa is not on a false floor or pedestal to assure maximum depth seating. After all, shoulders should be covered when seated comfortably in a hot tub. What size spa do most people buy? A 4-6 person spa fits well on a cement slab or on a deck and is not too small and not too big. These are the most popular spas. The size of the spa is not as important as the type of hydrotherapy which means how many jets or pumps is in the spa. 80-90% of hot tub installations are outdoors, so there is usually room for almost any size spa. Another consideration is lounger vs. non-lounger. The lounger takes up room in the spa. 80% of second time purchases of hot tubs are non-lounger spas, but others do prefer to recline in the lounger so it is an individual choice. The more seats, the more jets and jet configurations are available, even if there is just one person in the spa. If company comes over, the larger spa gives the option of having more people enjoy the spa together. A 7×7′ hot tub is a great and popular size for an all-around spa. The other way to look at it is in terms of operating cost and space. If a smaller spa is desired, then the 2, 3 or 4 person models may just do the job. Having warm water at the ready to produce a hydrotherapy experience for 1-2 people can come in a smaller size. This means less operating expenses and easier handling. If the water goes south on a 2 person spa, just empty and refill! The size of hot tub is in the end, an individual choice depending on budget, hydrotherapy needs, space requirements and lounger vs. non-lounger consideration. 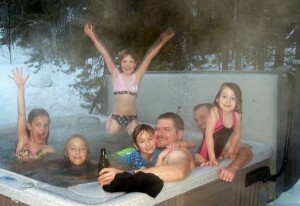 Get your factory direct hot tub from www.HotTubOutpost.com.